Video8 to DVD transfer. Melbourne, Darwin, Perth, Sydney, Brisbane, Hobart, Canberra, Adelaide. 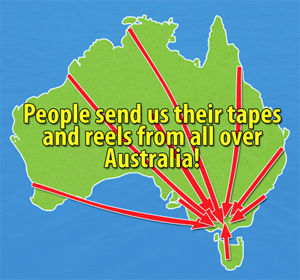 Transfer your Video8 Tapes to DVD, file and hard drive today! Come on all of your budding Stephen Spielbergs and David Attenboroughs! 1985 saw the introduction of the first Video8 camcorder, a few years later a slightly higher quality version of Video8 called Hi8 was released and then in 1999 Digital8 was introduced, which used technology very similar to MiniDV but stored on Video8 tapes. Owners of any of these three media should be aware that the tapes are very prone to degradation and any tapes older than 15 years should be digitised as soon as possible. If you would like to know how much it costs to have your VHS-C tapes transferred to DVD, please ring PhotoQ on 03 9855 0006 to get a quote. We don't just transfer Video 8 tapes. We also transfer VHS, S-VHS, Beta, 8mm, Hi8, Digital8, MiniDV and Umatic tapes. We can also transfer your old 8mm, 9.5mm, 16mm reels to DVD, file and hard drive, and Slides, negatives and prints to CD!